Our arrival at Ballyfin. All photos by David Lansing. Pulling up in front of Ballyfin I am gobsmacked. The size of the estate. The size of the house. 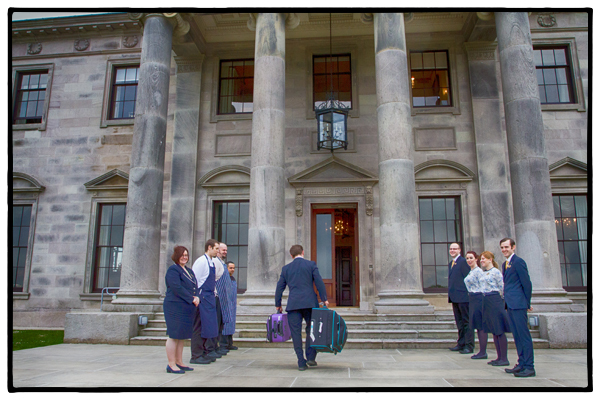 The staff—all lined up in front of the stairs waiting for our arrival. We’re so intimidated that for the longest time, we refuse to get out of our vehicle. As if we’ve just intruded on a G8 conference and the staff here thinks the Obamas have arrived instead of us. I haven’t been outside of our vehicle since early this morning yet still I feel the need to wipe my feet before going inside. But there’s nothing to wipe them on. 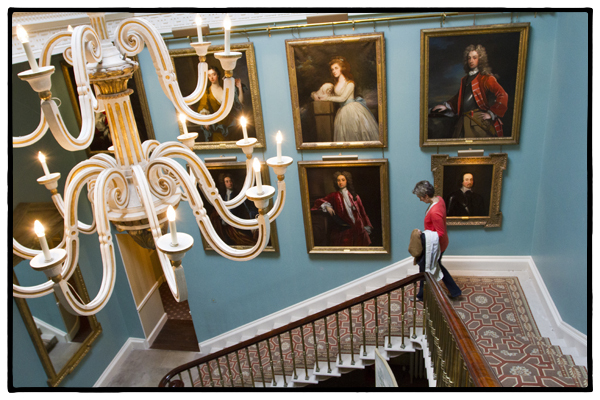 Sorcha leads us down the entrance hall with its antique Italian mosaic floor, through a doorway topped with giant elk horns, through the Whispering Room, and to the robin’s-egg-blue stair hallway where half-a-dozen grand portraits fill the walls. “Are those real?” I stupidly ask. The Cootes, you see, once owned Ballyfin which was built in the 1820s. The Mountrath Room at Ballyfin. 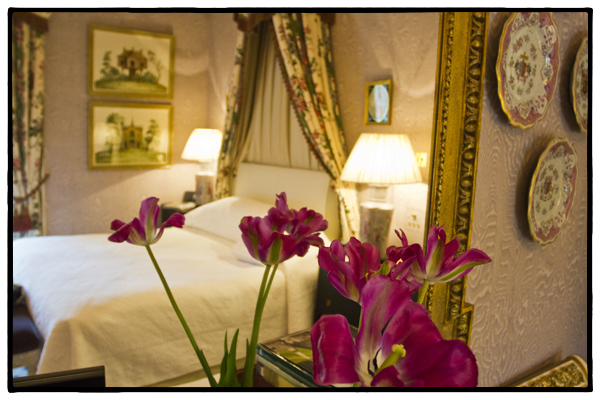 Up the stairs, still gobsmacked, down a long corridor or two we get to the Mountrath Room. 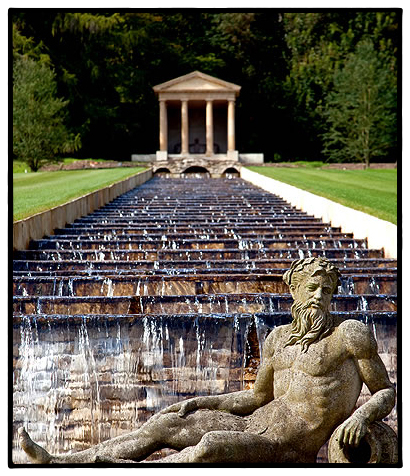 “Here we are,” says Sorcha, pulling back the heavy drapes to reveal views of the conservatory and, perfectly framed by our window, a watery stair case cascading down to a pond where Neptune appears to be sunning. “Cocktails are at six in the Gold Room,” she says. And with that, she quietly closes the door behind her, leaving us to ponder several things: How come we didn’t have to register? And why have we no room key? And, most importantly, how have we ended up in this enchanted manor house? 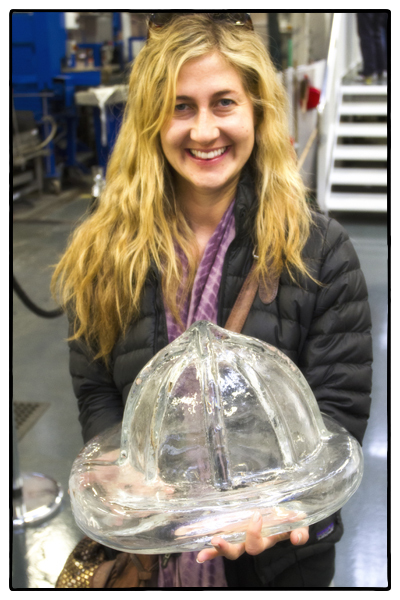 Casey with the fireman’s hat at the Waterford Crystal factory in Ireland. Photo by David Lansing. We have just started the tour at the Waterford Crystal factory when Casey spots a crystal fireman’s helmet. She lifts it, surprised at how heavy it is. I ask her if she can hold it over her head, like she’s going to put it on, while I take a photo, but she’s afraid she’ll drop it. And, you know, owe Waterford twenty thousand dollars or something. Of all the crystal pieces we see at Waterford—a Viking’s ship, a piano, even a scene of the destruction of the Twin Towers on 9/11–Casey is drawn to the fireman’s helmet because her husband, Justin, is a firefighter. I tell her she should buy it for him, as a souvenir. 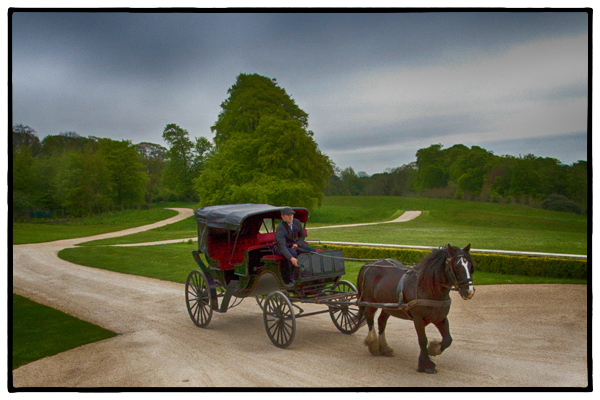 We met Casey when we were standing in front of Ballymaloe with about 20 other people waiting for a photographer to set up a group shot. While the photographer’s assistant moved the tall people in the back and the short people in the front, Jan made small-talk with Casey. In about two minutes, she discovered that 1) her dad not only went to college with us but was in the dorm next door 2) that her mom was in Jan’s sorority house and 3) that her aunt was Jan’s roommate for a year. Not only that, but her dad is none other than Tinker Hatfield. THE Tinker Hatfield. If you don’t know who Tinker Hatfield is, just Google his name. I don’t want to spoil it for you. You’ll be amazed you didn’t know who he was. But we don’t want to adopt Casey because she’s Tinker Hatfield’s daughter; we want to adopt her because she is just one of the sweetest, most sincere people we’ve ever met. Just like our real daughter. And I think the two would really like each other. Although, now that I think of it, she’d also be a perfect match for our son who is about the same age. If it wasn’t for the fact that she’s already married to the fireman. Damn. Jan in her wellies. Photo by David Lansing. 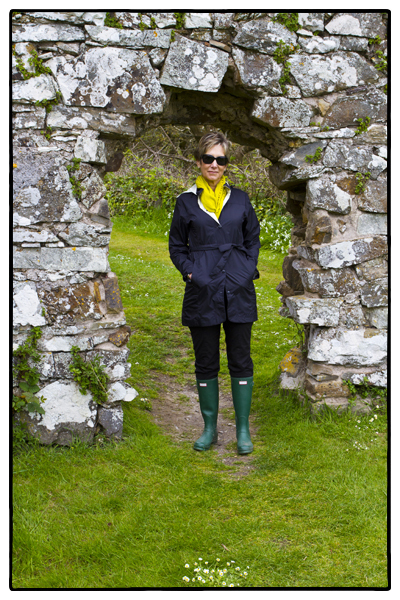 Before we head out on the Cliff Walk, Honor suggests that we put on a pair of wellies provided by the hotel. “It’ll be a bit slippery out there,” she says. I might put on some wellies but just glancing at the stacks of green boots in the wet room, it’s clear nothing will fit my rather large feet. Just as well. They’d probably make me look like a potato farmer. Jan’s wellies, however, make her look quite stylish. It’s gray out. And drizzling. (When is it not gray and wet in Ireland?) Honor leads us down a gravel path lined with wild garlic. The scent is overpowering. A few minutes later we’re standing beside some old stone ruins. 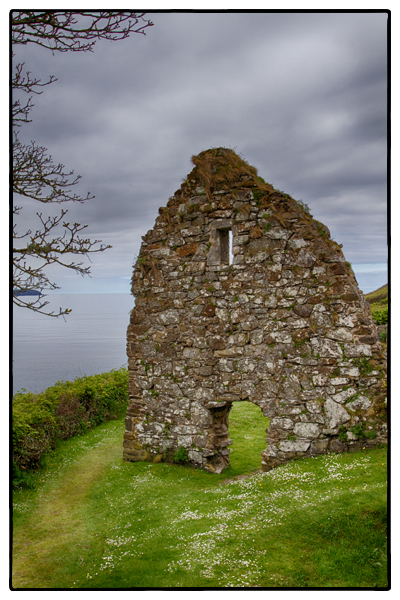 St. Declan’s oratory—a little church originally built around the 8th century on the site of Declan’s monastery. St. Declan, Honor tells us, was one of the first Irish saints. 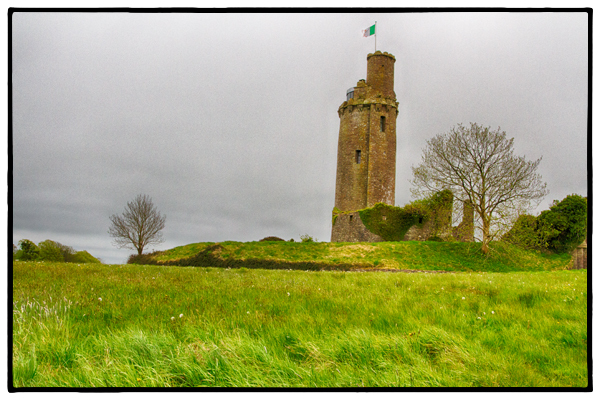 “He came before St. Patrick.” What they say about Declan is that he established a firm toe-hold for Christianity in the southern parts of Ireland back in the 5th century but it was Patrick that sowed the seeds across the land. A Pattern is a series of ritualistic events (like how we celebrate Christmas). The Pattern in Ardmore is held on St. Declan’s feast day, July 24, when thousands of people gather to circle this well while reciting a specific sequence and number of prayers before being allowed to take water from the well. Which is then either drank to cure what ails you or taken home where you might dip your fingers in it every morning before saying your prayers. Or anoint a sick child. It’s all a little crazy, of course, but then so are most of the strange little rituals of all religions. That, however, doesn’t stop some in our group from reverently dipping a hand in to the well and drinking the mossy green water. Including me. Just in case. The ruins of an oratory built on the site of St. Declan’s monastery on the clifftops of Ardmore (Ard Mor means Great Height). Photo by David Lansing. Starters at the Cliff House restaurant in Ardmore included beet macaroons and salmon marshmallows. Photo by David Lansing. Well, you have to love that. I mean at home, my own cooking revolves around whatever I’m currently harvesting in my garden, whether it be peaches or heirloom tomatoes, arugula or Italian Roma beans. But I have to admit that I’m not a big fan of the Ferran Adrià-style of molecular gastronomy. 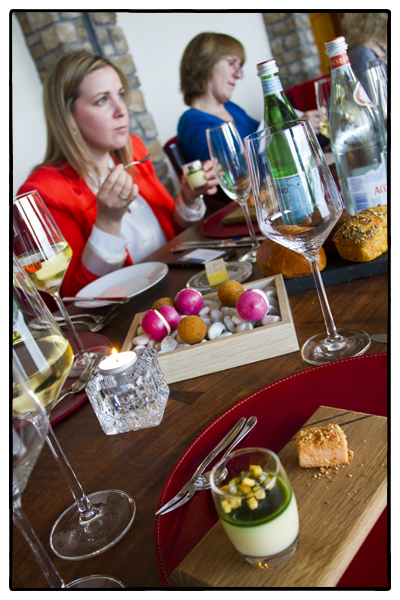 So I was a little taken-aback when the starters arrived at the table. First off, we got a plank of alder with a salmon marshmallow on it, a big gooey square of orange with overtones of fishiness. 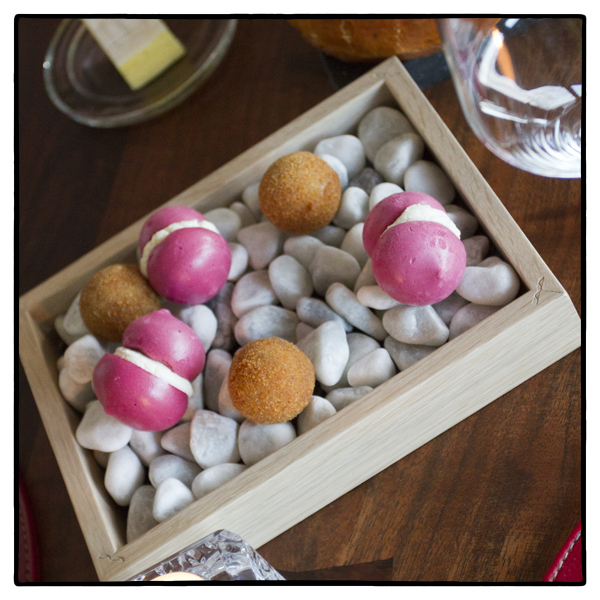 That was followed by a square rock garden topped with Easter egg-colored beet macaroons. Really? This is what we do with the gorgeous salmon caught by David Brown in Helvick and Ardmore Bay? We turn it in to marshmallows? And the lovely beets Martijn grows in Youghal are transformed into puffy macaroons? That said, once Kajuiter was done showing off, the rest of the dishes were outstanding, from the plump West Cork scallops that were lightly seared, just for a minute or two, and served in a puddle of green peas, bacon, and garden herbs, to the moist Helvick cod, baked with its skin on, and seated on a light sauce of brown crab and saffron sauce. Now if only Kajuiter (and other chefs) would get back to truly bringing out the essence of all the ingredients they work with and get over proving that they can make marshmallows that taste like salmon.